The heart of a multi-axis automation system is the ability to synchronize the motion of multiple motors to a designated “master” source device. Depending on the machine application, a source device may be an encoder device measuring web travel, position feedback from another motor that is driving a feed roll, or an Emerald Virtual (software) Motor. A Virtual Motor provides a software-configured internal master source with control over its virtual distance, speed and acceleration. the slave servomotor. 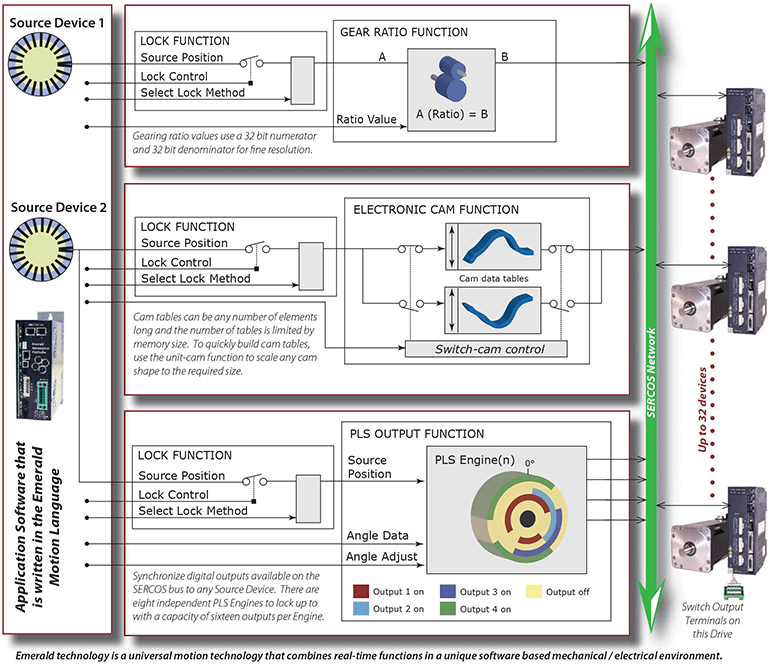 How the source device gets locked to the servomotor is critical especially when the source is running. The Emerald Automation Controller provides eight lock methods for smooth and accurate transition regardless of the speed of the source. The source device and the lock method are specified first. Then, the lock control is enabled to start the synchronization process. Digital outputs are synchronized to a master source using the programmable limit switch (PLS) function. Up to eight independent PLS engines can be enabled with each engine controlling the action of sixteen outputs. Digital outputs can be located on the servo drive or on the SERCOS network using 3rd party I/O interface blocks.